National University Honours 4th year exam result and Nu honours Final year result 2018 (exam year 2016). NU Honours 4th Year Exam Result 2018 will be published soon could be before the end of this month. The NU honours final year exam of session 2016 was held in the last August-October 2017. The university will publish the result so early than previous years. NU Honours 4th Year Exam Result 2017: National University Honours Part-4 / Final Year Exam Result 2015 session available from 14 may 2017 at 03:00 PM through the online and mobile SMS. The result also available from 3:00pm through the internet. Subjects are: Bangla, History, Islamic History, Islamic Study, Philosophy, Sociology, Social Welfare, Political Science, Economics, Soil Science, Zoology, Geography, Psychology, Management, Home Ehonomics, accounting, and others of BSc, BSS, BBS and others. The results of some subjects can be published in two or three steps. Result is available in the link of below published by National University. National University Bangladesh is publishing the honours result under Grading (CGPA) system from the session 2013 final exam which was held in 2017 and the result of all previous session was published under class system. How to get your NU 4th year result through the mobile phone? 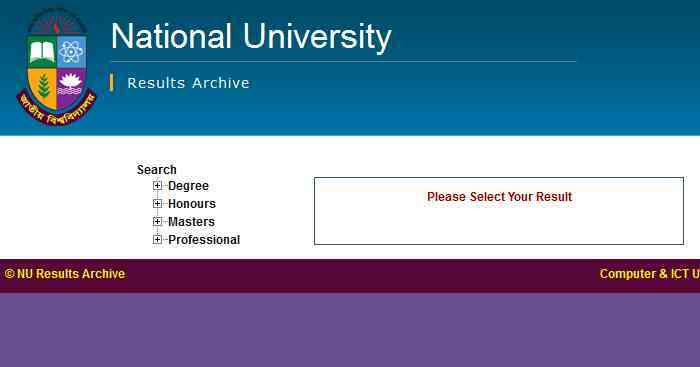 To get your National University honours 4th / final year result through the mobile SMS just follow the given instruction. Type your message option: nu<spage>h4<space>roll and send to 16222. Ex: nu h4 2468937 and send to 16222.